The purpose of this association is to promote walking as a worthwhile and healthy recreation and to foster international understanding and goodwill at walking events in different countries. During our summer months there are 2, 3, or 4 day walks in 16 different European countries and during our winter months there are 8 walks in the Pan Pacific region. These walks are non-competitive and vary from easy to fairly tough. 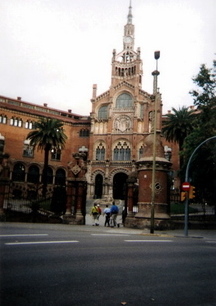 For example, there are eleven two-day walks in Europe, one of which was the Caminada de Barcelona which Enid and I completed recently. It is one of the easy ones, you can choose from 10, 20 or 30 km per day, and take all day to do it. Generally, the times allowed are very lenient, usually the whole day. The idea is that walkers have time to take in the sights on the way, as the route of the first day’s walk in Barcelona went past the Sagrada Familia, the Torre Agbar, the Hospital de la Santa Creu I de Sant Pau, to name a few, and went through what seemed like all the parks in the city, many of which included striking modern sculpture. One of the tougher walks is the 4 days march in Nijmegen, NL in July, in which men under 50 years of age must walk 50 km a day, men 50 – 60 and women under 60 must walk 40 km a day, and men and women over 60 must walk 30 km a day (for 4 days) to get their medal. There are also some 3 day walks. We booked this in April so it didn't cost very much. It was a birthday treat to myself. The connections were easy -- we flew to Liverpool with a short wait onto Barcelona, a coach ride from the airport to the hotel, which was just off the Ramblas. We went to the signing-on on the Friday evening in a huge sport stadium; it was so well organised. The race, sorry it wasn't a race, it was a walking event of 20k per day for 2 days, which is very doable for all our members. The first day was around the town seeing all the sights and parks. The water stations were great there was lots of chocolate, apples, bags of nuts, oranges and bottles of water all the lamp posts, trees and other stationary objects had arrows or coloured tape on; green was 10k, blue was 20k and red was 30k -- so there was no chance of us getting lost. It finished back in the stadium with a certificate, dancing music and beer!! There were around 2000 people from all over the world taking part and they were all great fun. The second day we were started again between 7am and 8am so it was a bit of a scatter on the metro to get there. Sunday we were sent up high into the mountains quite steep, some of it was single path and we all stretched back down the hill like a snake. It was about 8 miles up still with the water stations also a mountain bike race was taking place around the same route, the organisers coped with it all very well. The incline was more steep which hurt the knees a bit then we were directed along the side of a motorway for a mile, back to the stadium where there was a medal and another certificate given to us, with more partying and beer. We stayed at the stadium soaking up the atmosphere for a while and headed back to the hotel, we then went for a wander around Barcelona where you had to be on your toes at all times since there were some very odd people about. Then Monday morning we flew back from the very hot weather to the cold IOM!! 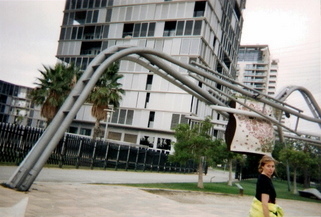 Enid pictured walking through one of the urban parks complete with modern sculpture. 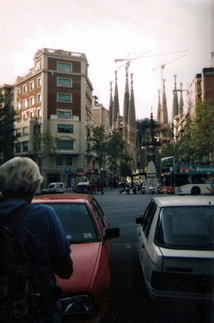 First sight of Sagrada Familia from a distance, with the cranes making it look even more surreal. 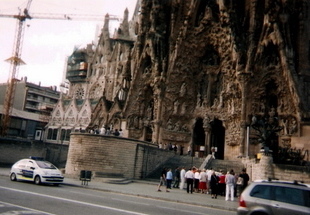 Sagrada Familia close up -- giving some idea of the huge size & intricacy of the building.